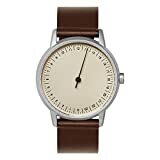 WatchiWatches presents The Best Slow Watch Review with top rated user reviews in the Best selling Slow Watches and Top Watch Brands categories with the latest and Best Slow Watch Review with top rated reviews and lowest prices available for global shipment depending on terms and conditions of the seller. Choose your new Slow watch from our Latest and Best Slow Watch review. 2.1 So who are these cool dudes behind the slow watch? 4 slow watch review: these beautiful Slow Watches have a great fitting and match every outfit! 5 Does the Slow Watch offer any additional functions? 6 Who is best suited to buy a Slow watch? 6.0.1 The slow watch is available from $250 to $320 and can be ordered with the links provided. The Slow Watch is a very welcome newcomer breathing fresh air of relief into the age old watchmaking industry with a truly revolutionary product. The Slow watch has quickly positioned itself as a truly amazing and enlightening Top Watch Brand to come out of literally nowhere and challenge the status quo in the world of watches. That world of watches virtually homogenious in nature seemingly full of carbon copies of one another without anyone daring to ask why is it so? These daring people at Slow Watches have done just that! Wow yes and in such spectacular fashion returning back to the roots of telling the time. Amazingly from within the calm of an ocean of watchmakers all thinking the same and working the same allbeit with varying degrees of refinement the two brilliant minds have come up with and launched to the utter amazement of the watch industry, The Slow Watch concept. Slow Watches has indeed helped us in the world of watches and by extension the world of time to radically review our concept of time. This refreshing approach will we hope encourage and motivate other manufacturers leading to other ideas and products being introduced into the market that might well help to open up further the way we view and understand the subject of time. Taking a quick glance at a slow watch may not turn everybody’s heads but those who would take a second look would notice that the watch dial of a slow watch is divided into 24 hours – which in itself is very unusual for a start! In addition, the slow watch concept only has one hand, namely the hour hand. The Slow watch does not have both the second hand nor the minute hand. Each hour is divided into 4 sections on the dial. This means it is only possible to read the time exactly every quarter hour. The slow watch interestingly therefore has only one hand, which slowly creeps around the 24-hour dial. The user will experience a radical change thereby with the way time is viewed. He will have a very relaxed and leisurely style of time display. So who are these cool dudes behind the slow watch? The two brilliant minds behind the slow watch are Christopher Nörskau and Corvin Lask. Worth looking these guys up, they are both from Hamburg, Germany. Whilst new watch brands were springing up like mushrooms all over the place and the watch market was flooded by cheap Chinese products, these budding entreupreneurs decided to enter the luxury watch market with their niche product. The rest is history, slow watches has proved to be a huge and resounding success. The two youngsters did not stop there, they commisioned the services of the Swiss company CPL design in Neuchâtel rather than going the Chinees route. As a result of their combined efforts their first Swiss watch was born, the one-hand wrist watch “slow jo” with a radically new feeling of time. This new No More Hassle, No Stress feeling of time took away the two fastest hands leaving behind the relatively “slow” hour hand. Every single Slow Watch has been manufactured by Ronda AG in Lausen / Switzerland using their Ronda Caliber 505.24H GMT to world class Swiss precision. Christopher Nörskau of Slow Watch recently said in an interview “Swiss-made was important to us. Because we did not want to besmirch our good idea with poor quality.” The success story of the “slow jo” in 2014 brought in millions in revenue and sales numbers are still increasing! This success story of the Slow Watch is pretty similar to that of the US brand MVMT watches which is also another super successful start-up with a USP, leaving the critics speechless! watch bands made ​​of metal, leather, nylon or fabric, enabling you to discover your personal style! slow watch review: these beautiful Slow Watches have a great fitting and match every outfit! 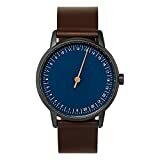 The slow watch models are all more or less unisex and are available in a variety of combinations of materials and colors.The different case colors and the wide range of available wristbands provide an enormous number of design options. The wristbands are available as classic metal bands, soft calfskin straps in many different colors as well as nylon straps and canvas straps. Do you want to find out more about the slow watch straps? You can find suitable straps with this Slow Watch bands link! Generally the watch case is made ​​of stainless steel and is available in silver, black and gold. In addition the case is finished in gloss, matt and brushed styling which in combination with the many different straps available, gives the ability to mix and match to any look and styling requirements. It’s easy to cover classic modern styling as well as Vintage and Military styling with a quick change of straps. No look can escape these well designed watch concept. Does the Slow Watch offer any additional functions? Many other watches offer all sorts of additional functions like for example date, moon phases, different time zones and the like. However the Slow watch certainly stays true to it’s minimalistic approach: The watch tells the time. Up to a quarter of an hour. That’s it. Nothing more. The Slow Watch Review in conclusion has to say that any additional watch functions are sought in vain. This watch is not meant to be played around with. It is a discreet companion, who unobtrusively ensures that the wearer has an overview about time – without feeling rushed by a second or minute hand. The slow watch concept strives to offer the best possible quality Swiss watches at an affordable price. All Slow watches are made in Switzerland including even the movement which is the heart of the watch. 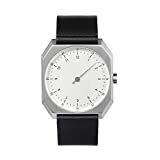 In order to still be able to offer the watches at an affordable price, Slow watch does not distribute it’s watches through any dealer networks, rather they are sold via direct sales and can be ordered directly from the factory online. Who is best suited to buy a Slow watch? 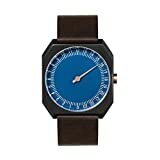 The WatchiWatches slow watch review, will like to clarify that these masterpiece watches are certainly not for everyone. The conventional person who would like to be able to plan their time right up to every minute and second will definitely not be the ideal wearer of such a revolutionary watch. Even getting used to the 24-hour dial format is not everybody’s cup of tea, let alone coming to terms with the Slow watch’s radically different designed dial and its entirely different philosophy of time. Traditional watch lovers fill find the Slow watch concept hard to swallow let alone digest. 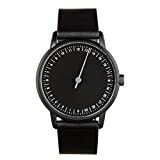 The slow watch is a watch for individualists who are looking for a new approach to the subject “time” and are not satisfied with the current concept of time. Also important to mention that this wrist watch is for people who want to slow down and regain control of their life. The target group are people, who live in the moment and who are not interested in every single second. You have to be open to new ideas and willing to throw old ideas about time measurement overboard. However, anyone who gets involved with a slow watch, will make an interesting new experience and find out that a watch may actually change and influece the way we perceive our time. The slow watch is available from $250 to $320 and can be ordered with the links provided.